Here is the latest installment of a series I started a year ago to help remind all my connections of the dangers of believing in spellcheck. Don’t get me wrong — I LOVE spellcheck! It has saved me many times from embarrassing errors (spelling is not one of my strengths). But spellcheck does only one thing well: it spells. It knows if a word is spelled correctly. It does NOT know if a word is used correctly. 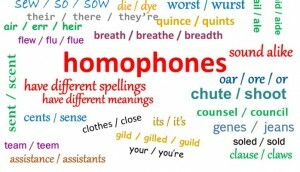 That’s what we writers have to be alert for: those pesky words known as homophones (words that sound alike — or nearly so — but mean something different and are spelled differently). If we want to be seen as thoroughly professional, we need to be “on our toes” with this! Now I don’t expect anyone to memorize all the possible problem words; I often look words up myself online (isn’t that a wonderful thing we can do?). I use the YourDictionary.com site because it shows many different definitions from several dictionaries, not just one. You can get a really good lesson just looking through those definitions!